← 5 January 2016 Salted Alaska Cod Fish Cakes. 7 January 2016 Salted Cod Fish Stew. 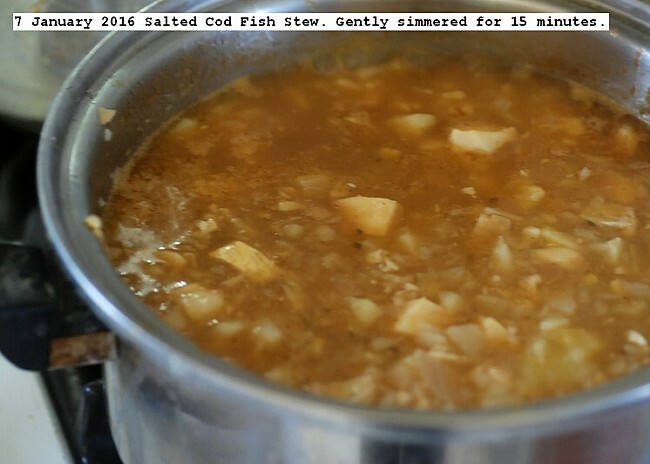 http://www.durgan.org/2016/January%202016/7%20January%202016%20Salted%20Cod%20Fish%20Stew./HTML/ 7 January 2016 Salted Cod Fish Stew. Alaska cod salted fish 0.826 kg, cost $16.37,was made into a stew. Ingredients were garlic bulb, medium onion, six medium potatoes, cup of vinegar for flavor, liter of home juice tomato and celery. Procedure was to cut the cod into small cubes, soak for 18 hours changing water four times to reduce the salt and re-hydrate the cod. When soaking is completed, steam for 15 minutes ready for mixing. The garlic and onion were made into small pieces with an OXO chopper, then sauteed and placed in the mixing pot.The potatoes were baked and cut into small pieces and added to the mixing pot.A half cup of vinegar was added for flavor. A liter of home made tomato juice and celery was added. The ingredients were mixed, brought to a boil and allowed to simmer on low heat for 15 minutes.The finished product was placed in the refrigerator for consumption within the next few days. This is an expensive luxury due to the high cost of the cod in my area. This entry was posted in Uncategorized and tagged Alaska Salted Cod Stew, Salted Cod Fish Stew. Bookmark the permalink.